and has a great show attitude and wonderful movement! I'm lucky to be her breeder and owner! Junior Championship at 10 months! 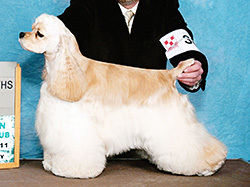 Rachel finished her puppy and junior show period as multi ResBIS, BIS and BISS winner! 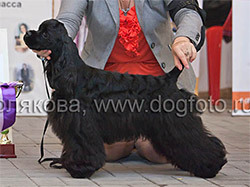 in Budapest 2013 under the respectable judge Mr. Edd Bivin (USA)! of September, 2013 under the respectable judge Mr. Fred Peddie (Canada)! judge's critique for Rachel and really appreciate it! in Helsinki, Finland under the respectable judge Mr. John Reeve-Newson (Canada). I'm so proud of my wonderful black girl! 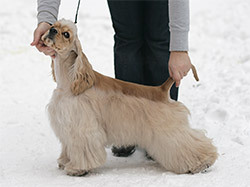 in 12-18 months class at American Spaniel Club Flushing Show, January 2011! to her breeders: Laura Heidrich & Genea White Jones! 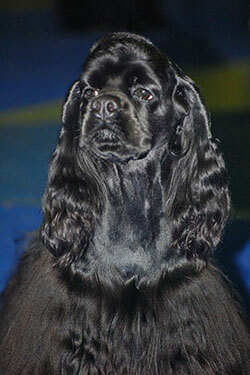 Our wonderful black girl Inge finished her American Champion title in Nov 2010 by Mike Pitts! 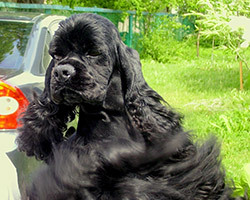 Thanks a lot for the excellent care about our Inge to Mike and Linda Pitts! Maha is out of our beloved Maverick and Favourite. She is a pretty and sweet girl. 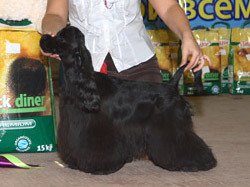 and BIS Baby titles at her first show at 3,5 months old! She is our special girl. And we are happy and proud to have her in our kennel! and Ch St'James N'Mars Performance Favourite (Favourite). multi R.BIS and BIS placements during her show career. And we are happy to have her in our kennel!